The Fort Worth Business Press has named Michael Millians, an educator at The Oakridge School, among the 2019 honorees for its 40 Under 40 Awards. Millians, 37, teaches Advanced Placement Government and Economics in the Upper School. He also advises the Oakridge Debate Team and coaches varsity field hockey. When he is not in the classroom, Millians serves organizations and initiatives such as the Women's Center of Tarrant County Victory Over Violence Walk/Run, Fort Worth Sister Cities International, and the Colorado Trail Foundation. He also has volunteered as a soccer coach for the children of U.S. military servicemen and women. 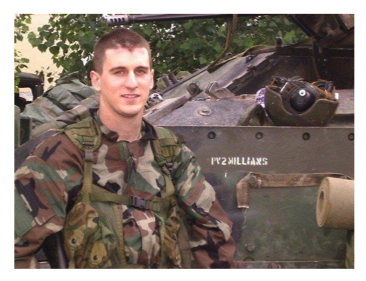 "We knew early on that Mr. Millians was a gifted teacher and leader, " said Head of School Jon Kellam. "He joined Oakridge in 2015 and from day one, has had a positive impact on his students, both in the classroom and on the field. He is dedicated to shaping and molding the next generation of leaders and our students respond well to Mr. Millians, in part, because they sense his passion for education, his zest for life, and his belief in youth. He is well-respected by his colleagues and we applaud him for this well-deserved recognition from the Fort Worth Business Press." Millians was nominated for the award by David Keltner, a former Justice on the Texas Court of Appeals who now is a partner with the law firm, Kelly Hart & Hallman. In his nomination letter, he wrote: "I have known Michael all his life. In fact, when he was in high school, I gave him his first job. Throughout his life, he has always excelled at everything he has tackled while maintaining the friendship and admiration of his peers. Michael was in college in 2001, but when the 9/11 disaster occurred, he began the enlistment process in the Army the very next day. At the time, he was leading a typical college student's life—but he selflessly put all that on hold to serve his country in its time of need. And he chose one of the toughest paths by selecting the Infantry. Eventually he served at the most forward northern base at the Demilitarized Zone in Korea. When his enlistment was completed, he returned to college, earned his B.S. in political science at Texas Wesleyan University, and then began his teaching career by serving as an in-house substitute teacher and assistant field hockey coach at Trinity Valley School. He then was presented with an opportunity to teach full-time at the Oakridge School, and he quickly became one of its most beloved and respected teachers and coaches. He has an excitement about what he teaches and what he coaches, and it obviously inspires his students." While humbled and proud to be presented with the distinguished award, Millians said he wouldn't have had the opportunity to be recognized without the advice and counsel of mentors and valued colleagues. "The administration team at Oakridge has encouraged me to explore nontraditional teaching methods in the classroom and in my field hockey program," said Millians. "My colleagues have provided me unconditional support, encouragement, and positivity. Most importantly, I need to acknowledge my students who have provided me an opportunity to grow and learn as an educator, coach, mentor, and person." The Fort Worth Business Press says its 40 Under 40 honorees are celebrated to recognize brilliance on the rise. They are 40 honorees all under the age of 40, destined for striking accomplishments in their chosen field, from the corporate sector to maverick entrepreneurialism. They are leaders today and are sure to be part of the next generation that will make Tarrant County a great place to live and work. Kyle Morris, DeMars & Associates, Ltd.
Lane Reeder, Reeder General Contractors, Inc.
Kurt Schaal, Capital One, N.A. The 40 Under 40 Awards Ceremony and Dinner will be held Wednesday, April 24 at Cendera Center. Tickets are available at FortWorthBusiness.com. Select "events" and then choose "Purchase tickets."